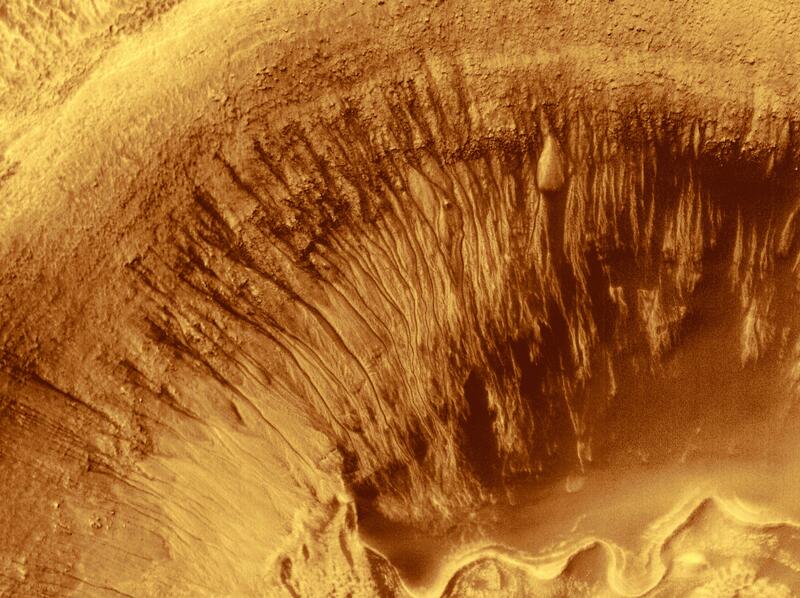 Channels and Gullies in Nirgal Vallis--The Work of Water? 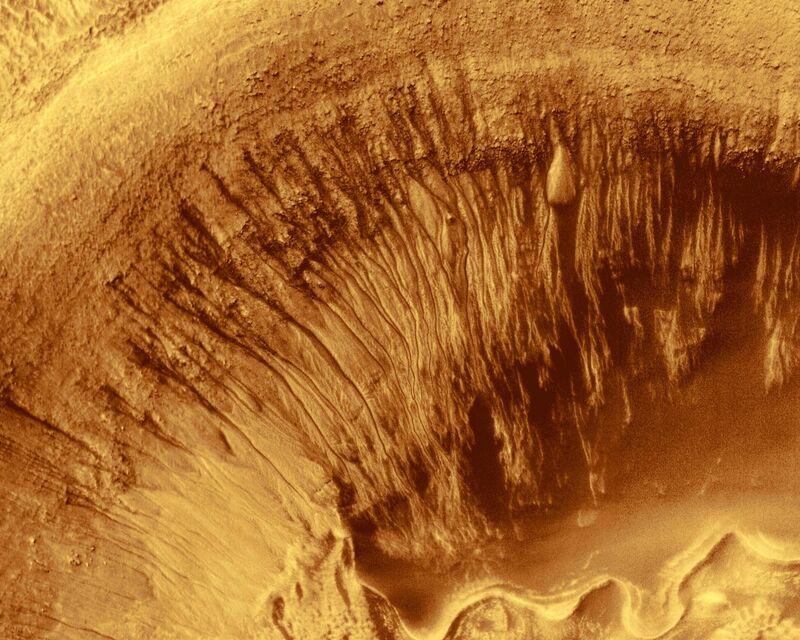 Newton Crater is a large basin formed by an asteroid impact that probably occurred more than 3 billion years ago. It is approximately 287 kilometers (178 miles) across. 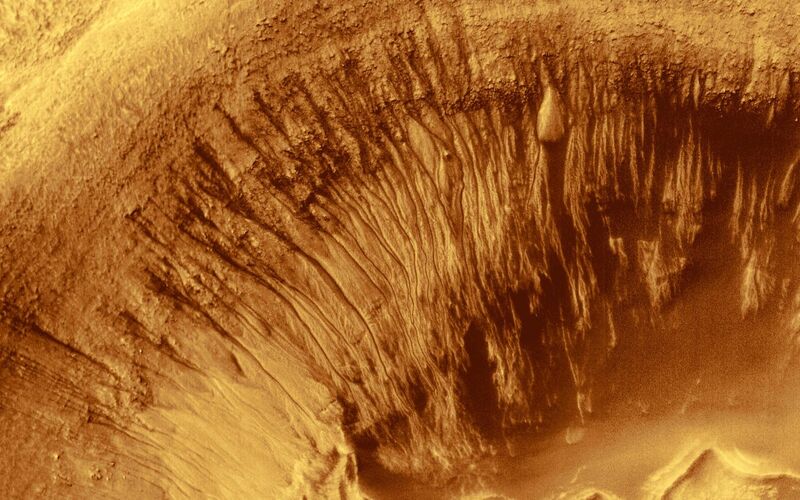 The picture shown here (top) highlights the north wall of a specific, smaller crater located in the southwestern quarter of Newton Crater (above). The crater of interest was also formed by an impact; it is about 7 km (4.4 mi) across, which is about 7 times bigger than the famous Meteor Crater in northern Arizona in North America. The north wall of the small crater has many narrow gullies eroded into it. These are hypothesized to have been formed by flowing water and debris flows. Debris transported with the water created lobed and finger-like deposits at the base of the crater wall where it intersects the floor (bottom center top image). Many of the finger-like deposits have small channels indicating that a liquid--most likely water--flowed in these areas. Hundreds of individual water and debris flow events might have occurred to create the scene shown here. Each outburst of water from higher upon the crater slopes would have constituted a competition between evaporation, freezing, and gravity. The individual deposits at the ends of channels in this MOC image mosaic were used to get a rough estimate of the minimum amount of water that might be involved in each flow event. This is done first by assuming that the deposits are like debris flows on Earth. In a debris flow, no less than about 10% (and no more than 30%) of their volume is water. Second, the volume of an apron deposit is estimated by measuring the area covered in the MOC image and multiplying it by a conservative estimate of thickness, 2 meters (6.5 feet). For a flow containing only 10% water, these estimates conservatively suggest that about 2.5 million liters (660,000 gallons) of water are involved in each event; this is enough to fill about 7 community-sized swimming pools or enough to supply 20 people with their water needs for a year. The MOC high resolution view is located near 41.1°S, 159.8°W and is a mosaic of three different pictures acquired between January and May 2000. The MOC scene is illuminated from the left; north is up. The context picture was acquired in 1977 by the Viking 1 orbiter and is illuminated from the upper right. Note: This is an updated color version of PIA01039.